No longer just clever toys to thrill users in ‘show and tell’ situations, virtual and augmented realities can now have significant impacts on a business’ bottom line, reports Vanessa Choi. As AR has reported previously, “the commercialisation of virtual reality technology has brought a complex technology into the hands of almost anyone with a smartphone and as little as $50” (Anthony Caruana, AR147). This is having huge ramifications across multiple different industries, including healthcare, education and entertainment. It is also now having a significant impact on the built environment, both on the way we construct our buildings and the display them, and also the products and services that go inside them. Before we go any further though, let’s break down exactly what we mean by virtual reality. There are several different technologies in this sector. The first and simplest is 360-degree videos, which are already widespread and allow people to view a video that can be freely rotated, as the name suggests, 360 degrees. Since March 2015, it’s been possible to upload such videos to YouTube, while a growing number of other online platforms are now incorporating 360-degree content into their own media libraries. All you need to view such content is a video screen or monitor. You don’t need a special headset, but immersion is significantly more effective with one. virtual reality (VR) is the computer-generated simulation of a three-dimensional image or environment that can be interacted with in a seemingly real or physical way by a person using special electronic equipment, such as a helmet with a screen inside or gloves fitted with sensors, whereas augmented reality (AR) is a technology that superimposes a computer-generated image on a user’s view of the real world, thus providing a composite view. Thus, that Pokémon craze that swept the planet a couple of years ago was a prime example of AR in action, accessible via nothing more than a smartphone and the requisite app. But the technology has a much wider variety of applications than simply games that give users the ability to chase brightly coloured little figments of someone’s imagination across a cyber world and put them in a (virtual) cave. For those working in the design and construction space, there are now apps available that can make their jobs significantly easier, literally opening doors to another dimension. Then there’s AR Entrance, a free AR app that visualises the scope for design for any given entrance situation, using the company’s products for physical access control. Using this app it’s possible to see how your preferred solution will look in a building, generating a picture that can be saved and forwarded. Using a smartphone camera’s live view this can even be done without a snapshot. VR, on the other hand, currently does require extra equipment – typically a head mounted display (HMD) that covers the eyes and ears of the wearer. VR allows users to explore remote regions, play sports and games, try on clothes and drive fast cars. All without leaving the comfort of their own homes. The equipment ranges from disposable brackets (the free Google cardboard) that you can actually make yourself, to high-tech pieces such as Oculus Rift, Samsung Gear VR and HTC Vive. The latter HMDs block ambient sound and light, so the only sight and sound sensory input comes from the VR system. Some, including the three mentioned previously, connect wirelessly to a smartphone or similar device, which transmits the virtual environment. They also now allow users to step into whole new worlds, where it is possible to explore a range of tools and applications. Imagine being able to access the biggest and most constantly changing showroom on the planet? It’s now distinctly possible. Some providers now have apps that also have a virtual reality option. The dormakaba 360° City app is free and provides users with access to the company’s virtual world, displaying its wide range of products from a user’s perspective in a three-dimensional environment. You can explore this city, which comprises an airport, private residences and an industrial complex. All of these places have products already installed that you can look at, touch and explore how they work in the relevant spaces, while considering exactly how they may fit and work in the place that you are designing. But that’s not all. It also offers detailed information on the products, such as fact sheets and configuration options. It explains the operating principles of each product and can be combined with virtual reality glasses to explore further. This award-winning app is available in no fewer than 12 different languages. The advanced virtual reality version of the app extends the experience and possibilities. Let’s say you’re an architect sitting happily on your task chair at your practice’s studio, with a screen and your latest designs in front of you. You’re at the specification stage, weighing up the options of which would be the best and most fitting products to recommend in the various areas of the building you are designing. Actually, you don’t have to imagine such a concept. It already exists. Well, it doesn’t exist. And that’s the entire point of it. The Virtual Design Centre is dormakaba’s new virtual headquarters and, using an HMD and controller, visitors can explore inside while a narrator explains the history, values and mission of the brand. 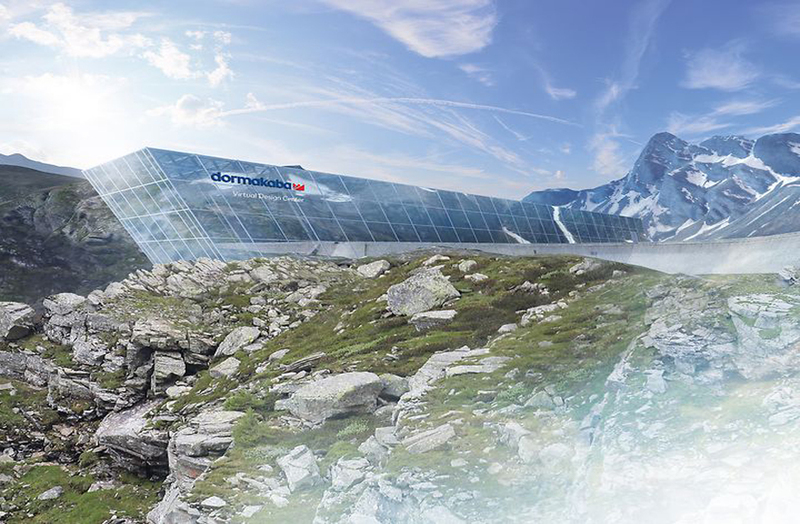 “We want to create virtual showrooms where we can welcome customers and architects,” says Uwe Eisele, marketing for dormakaba. “Our staff will guide them through showrooms that have been configured in line with their wishes, where they can try out our products and experience them.” These 3D meetings are based on similar principles to multi-player video games, with participants assigned avatars and logging on to meet inside the Virtual Design Centre. They can also explore the showroom independently this way. A second use for the technology works for both the company itself (the members of which can utilise it as a virtual office) and particularly for global practices with offices on different continents or in different cities. Using this technology, practices will be able to hold three-dimensional meetings, exploring models and concepts, and sharing ideas and information with colleagues across the world without leaving their office base or adding to their carbon footprint. For the last couple of years, 360-degree video has been used to display products via the app downloadable from the Apple App Store or Google Play, but this new innovation takes the technology a huge step further. “After all the research, it was clear that virtual reality would allow our brand to be experienced by almost all the senses,” says Eisele. “This gave rise to the idea for a virtual company headquarters. We then had to decide where our Virtual Design Center should be located. We looked for a special place using satellite images from Google Maps, and came across Piedmont in the Italian Alps. To create a very precise visual of the location, a small team from the agency took a road trip there: using special cameras, they surveyed the area and captured it digitally. Together with architects, we then designed a building that could feasibly be integrated into the landscape. “Innovative projects require an agile approach – and always being open to new ideas. But the excited faces of visitors to our Virtual Design Center prove that our approach has been a complete success,” he concludes. dormakaba 360° City, also available for Windows Desktop, can be downloaded at www.dormakaba.com/360-city or via the App Store or Google Play. AR Entrance can be downloaded via QR codes at www.kaba.com/ar-app and is also available via the App Store or Google Play. Vanessa Choi is dormakaba’s marketing communications manager | Pacific. This article originally appeared in AR153 – available online and digitally through Zinio. The potential uses for virtual reality in the built environment has grown exponentially with the photo realistic components one can use to build the space and items with. A few years ago it looked like we were looking at a video game, not it’s hard to distinguish it from a real life photograph. As technology advances for recreating objects in VR/AR, there will always be new uses only limited to ones imagination.